The sinking of the RMS Titanic has been the subject of countless investigations, and the true cause of the tragedy is hotly debated. Now, explosive photographs have surfaced containing shocking revelations about a series of shortcomings which contributed to the legendary ship’s tragic sinking. These images are uncovered in an hour-long Smithsonian Channel documentary that tells the story of the unluckiest ship in maritime history. TITANIC’S FATAL FIRE premieres Saturday, April 15th at 8 p.m. ET/PT. The film features photographs from the private collection of the Titanic’s Chief Electrical Engineer, John Kempster, that had been stashed away in an attic for over 100 years. The photos show the momentous launch of the famous ship and hold hidden clues to the impending catastrophe. In TITANIC’S FATAL FIRE, these unbelievable visuals bring to life the Titanic disaster as never before. Fire-damaged hull: the most shocking revelation, perhaps, is found in two critical photos that show a thirty-foot long black streak on the Titanic’s hull. It is evidence that a fire below decks in a coal bunker caused serious damage that weakened the ships hull in the same area where the iceberg later struck the ship. Single-skin hull: double-skin hulls had been a feature of ships since the 1850s, but there was intense pressure from Harland and Wolff to complete the largest ship in the world on time and within budget. 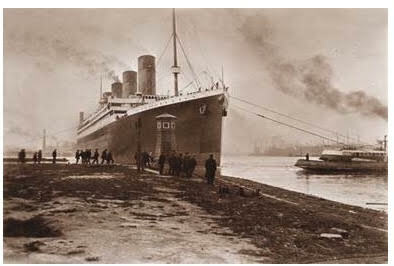 Photographic and documentary evidence shows that they did not use the best quality steel in the Titanic. Competing ship drained resources: a photo shows the Titanic and her sister ship, the Olympic, side by side in the building yard, revealing how these two enormous ships were being built simultaneously, leading to a huge drain on materials and availability of experienced workers. Using a newly-devised CG technique to animate the extraordinary original stills, along with a new colorizing technique, the documentary brings viewers into the world of the Titanic’s construction, diving into and around the bustling environment in an authentic experience of the shipyard. The photographic evidence was discovered at an auction house by Titanic expert Steve Raffield and investigated by journalist Senan Molony. TITANIC’S FATAL FIRE is a Blink Entertainment Distribution/What Icebergs Productions Inc. production in association with Smithsonian Channel, Channel 4 Television, Discovery Canada, France 5 and SBS. The executive producer for Blink Films is Dan Chambers. Charles Poe and David Royle serve as executive producers for Smithsonian Channel. To learn more, go to www.smithsonianchannel.com, or connect with us on Facebook, Twitter, and Instagram.